I will not allow my son Sam take the ISAT this year because there are no good reasons for him to do so. High-stakes tests, like the ISAT, pressure children. They label and stigmatize them. They interrupt real learning and real enjoyment at school. They don’t tell me anything I need to know about my son. 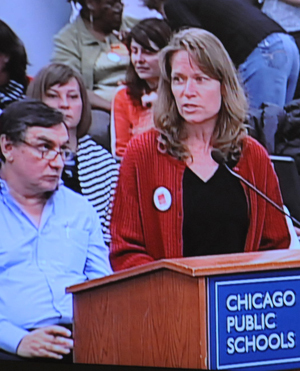 Sharon Schmidt, Substance editor and CTU Testing Committee chair person, spoke at the February 22, 2012, Board of Education meeting against the misuse of test scores to label schools "failing" or "low performing." The Board voted to fire the staffs of 10 schools because of the schools' performance based primarily on test scores. The test scores of most children reflect family income. Teachers of low-income students are blamed for realities they have no control over. In this article, Schmidt writes about why testing is bad for individual children and families. Substance photo by George N. Schmidt.Sam has learned so many things in fifth grade. He’s studied history and science, he’s read dozens of novels and many pages of informational text, and he has learned and practiced new concepts in math, art, music, computers, physical education and health. He’s written fiction, poetry, and research reports. He’s learned how to interact with new students and teachers. He’s been thinking critically about politics and people. Sam’s progress is evident to me through observation, conversation, report cards, teacher meetings, schoolwork, and homework. In contrast, his ISAT test scores from three reading and three math tests would not tell me any of what he’s learned this year. The scores would only show how he compares to other test takers in answering simplistic multiple-choice questions and completing formulaic writing tasks. The ISAT doesn’t measure thinking, motivation, or interest. It measures a child’s ability to choose the answers, among many plausible distractors, to questions deemed valuable by a test maker. And within their limited subjects and form, the tests can’t precisely measure the child's ability to choose correct answers. There are too many variables in the test and the child. A standardized test isn’t a scale or a barometer. A child is not a piece of meat or a weather pattern. One day a child may answer a question about main idea in reading “correctly”, the next day “incorrectly”. Not everyone can do well on these tests. When tests are written, test items are vetted to “work”, meaning that the results must fall along a bell curve. If all students answer a piloted test question correctly, that question will not be used. The tests are designed to rank and sort students. Test scores do not help parents. I’m concerned that my sons learn and succeed, but I don’t need to consider whether they’re “better” or “worse” than other children on the ISAT. That doesn’t tell me anything real. I love my sons for their unique selves. While I’m thrilled when they accomplish new things, I don’t want them in a test score race to the top. I don’t want Sam to feel superior or inferior to others because of an ISAT ranking. There are some competitions in life, but learning should not be one. My son’s value as a student has nothing to do with his percentile ranking. Why should I waste Sam’s time and effort to obtain a number that tells me nothing I need to know? These tests don’t help him learn. The test results don't help his teachers teach him. Over the past two years I’ve opted out Sam from dozens of other standardized tests. Instead of wasting his time at school, I’ve had Sam read silently to himself whenever CPS has administered a standardized test. Reading books of his choice helps him learn. Since I found out two years ago how much experimental testing was happening, I’ve opted him out of dozens of tests. He has skipped the CPS Learning First Benchmark Assessments, the Scantron Performance Series tests, and the pilot Common Core. CPS administered each of these standardized tests in several subjects, several times a year. But there are no good reasons for this excessive testing. The new civil rights is high stakes testing in America. Parents and children have rights. Ed Reform policies that disenfranchised parents and children are wrong. American education is being dismantled one test at a time. In the name of accountability, No Child Left Behind, and now Race to the Top is compelling the entire education system to succeed at the test or face Draconian punishments ranging from teachers firings to entire School Districts being shut down. This testing frenzy is based on the erroneous belief that the entire education package from curriculum & texts to student readiness is working at peak efficiency and the ONLY source of failure are teachers and administrators. It is not. The result is that schools now are forced to spend as much as 80% of their educational minutes in some form of test preparation. Parents - ask your kids how much of their school day includes test prep. Ask your kids if they enjoy test prep. Ask your kids if test prep teaches them something new. Chance are your child will let you know how dull and repetitious and demoralizing test prep really is to them. This is NOT what most parents want for their children. I applaud this parent who chose not to participate in this ridiculous paper chase. Testing is created by adults, for adults, and offers little to nothing in terms of productive feedback to the parent, child, or teacher. The only way for this madness to change is if PARENTS stand up and join this courageous leader and say "Testing has me Mad as Hell, and my child won't be taking it any more!" John Lawhead passed along your March 4 statement of reasons to not opt into the testing that's going on in Chicago and everywhere else publishers are hustling money out of NCLB. Your blend of reason and passion made your argument the best I've read on the subject. I'm working with John and others--teachers and parents--in New York, trying to overthrow the oppressive testing regime imposed on the children and the schools. I come at it from a test research and development background and wanted to send you a piece I did a couple of weeks ago on inherent flaws in the exams. My basic premise is that you can't begin to have a meaningful discussion of results (simple student scores or elaborate formula-derived, value-added extrapolations) if the tests are demonstrably defective. So, I examine the ingredients--the items. I use the NAEP to expose the underlying flaws in the NYS exams--although I'm not endorsing the Nation's Report Card. I agree with your central point that the information coming out of these measures is useless--and of no benefit to children or learning. Thank you for your forceful observations. Substance comments must be signed with a first and last name and a valid email address. While the last comment regarding this article spoke profoundly against the ISAT, agreeing with the Substance editorial position, we deleted it due to our comments policy. Next time, give us your name. I AM VERY UPSET WITH THE CHICAGO PUBLIC SCHOOL SYSTEM. I WISH THAT MORE PARENTS WOULD SPEAK OUT AGAINST THE ISAT. IT SERVES NO PURPOSE. IT'S WAY TOO MUCH PRESSURE ON THE CHILDREN AND THEY ARE TOO STRESSED OUT. THE CRUCIAL GRADES 3,6, AND 8 NEED TO STOP. THE SYSTEM HAS FAILED SO WHERE IT IS HAVING OUR CHILDREN PAYING THE PRICE. Tests are a part of life. True, many people fall into the "I just can't take tests" category. If your child is in that category then the testing has served its purpose and shown that maybe your child needs to choose a different path in life. I hold a professional doctorate degree in pharmacy. The number of tests I have been subjected to would probably make other people cry themselves to sleep at night, at the least. And the final step in getting my pharmacy license? Yep, a test. A massive, horrid cover-everything-you-ever-learned test. That is the path I chose. My oldest daughter just achieved an advanced score on her ISAT and she is only 8 years old. She was excited to take this first of many tests. They have kids take the isat and other tests to see where they will place them later in life. What your job is going to be. They pin your test scores to everything. one day an administrator said people with low scores or normal scores on the isat have behavior problems and that those with exceeds do not. i believe that's not true. These tests are just something they use as an excuse to separate children. Yep, I will be joining to opt out of these tests. I never learned anything from a multiple choice test. Only through critical thinking I gained knowledge. Thanks to private school for that!